Scott Pallets and B&Q devised the ground-breaking Green Pallet Scheme as an important and innovative step on B&Q’s ‘One Planet Home’ journey to cut its carbon footprint by 90%. The scheme is a logistics project designed and implemented to address the waste and sustainability issues associated with single use white wood pallets – ensuring B&Q is able to minimise its wood waste in line with its environmental and sustainability objectives. The diverse and varied nature of the products being sold in B&Q, and the global nature of its sourcing and supply chain, meant that re-useable transit packaging previously did not exist, so poorer quality, single use, white wood pallets which had to be disposed of after their first trip, caused a significant waste issue. 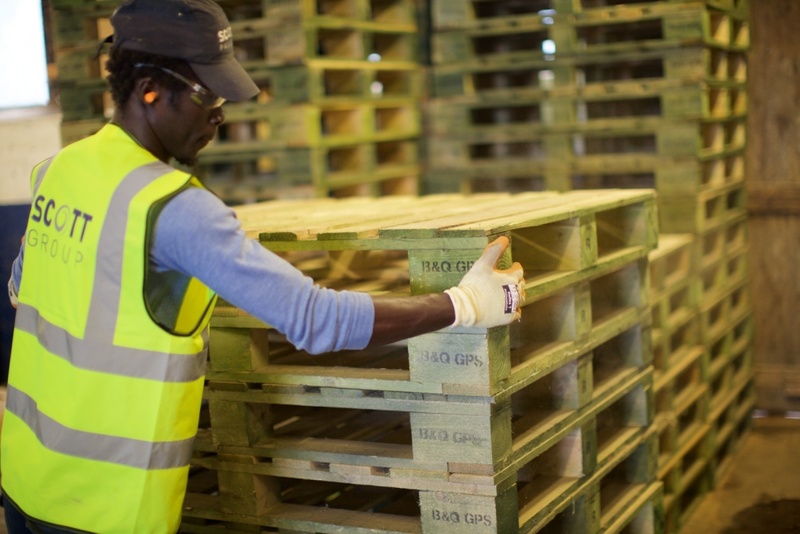 The Green Pallet Scheme offers returnable pallets in bespoke sizes, made only from responsibly sourced timber. Operating globally, the scheme is for suppliers whose only option previously was single use, white pallets. Thanks to the scheme, over 100,000 sustainably sourced pallets have been recovered, at least 5,000 fewer tonnes of virgin wood has been used, and transport miles have been reduced across the entire supply chain. The delivery and success of the scheme relies on engagement throughout the supply chain and commercial teams; and we hope that by utilising our knowledge and experience here, along with specialist pallet design capabilities, this is a model of excellence that can be rolled out to the wider global market place to help improve the sustainability credentials of many more businesses.